The beauty of the glory of the Face of God is reflected in the mountains surrounding the Sanctuary of the Holy Face in Manoppello in the days leading up to the historic “Omnis Terra” feast and procession. 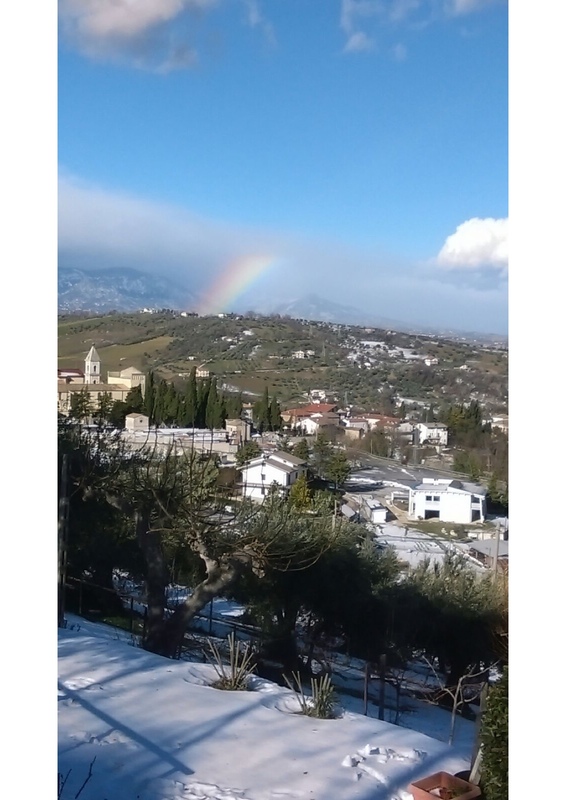 (Sr. Blandina Paschalis Schlomer took this breathtaking photo of the Sanctuary and hills covered in pure white snow and a beautiful rainbow.) On the second Sunday of Epiphany, January 15, 2017, the Basilica of the Holy Face established the first new feast and procession, making it the third on the calendar of the Sanctuary, since the year of 1712. 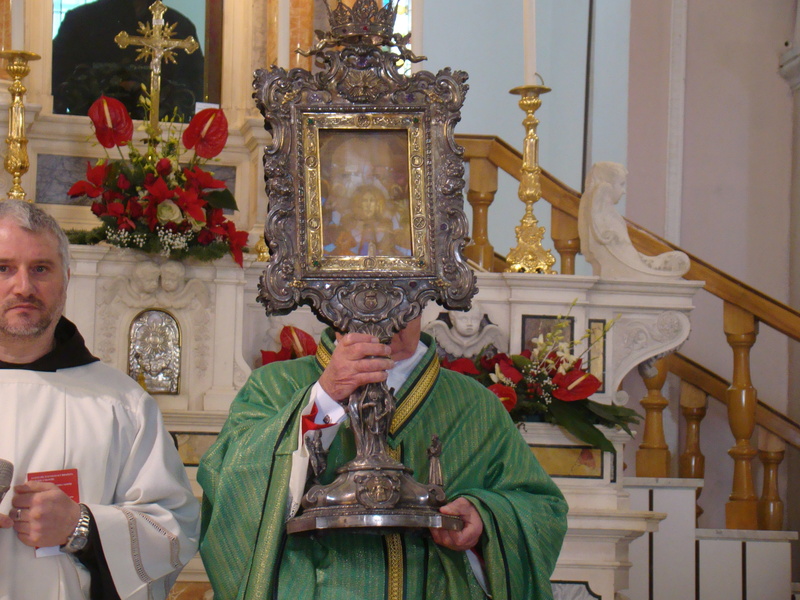 The “Omnis Terra” (All the Earth) procession in honor of the Holy Face had its beginning in 1208 when Pope Innocent III processed with the Veil of the Holy Face from St. Peter’s Basilica in Rome to Spirito Santo church and hospital, giving alms to the poor and the sick along the way. It was very fitting then that Our Lord’s Holy Face should be specially honored by a new feast and procession at the Basilica Sanctuary of the Holy Face in Manoppello on this same Sunday. “It was as if the sky had opened a window over Manoppello for exactly that day. It had been snowing all the time before, then on Friday a rainbow appeared. On Saturday it was immaculately blue. On Sunday, Omnis Terra, the clouds had come back. And on Sunday night Manoppello was covered with snow again. Liturgy of the Eucharist and the procession with incense, candles and beautiful music by the choir of Maestro Cosantini was so noble and “degno” [worthy] that it couldn’t have been performed more nobly in Saint Peter`s in Rome. The homily of Don Americo [Mons. Americo Ciani] was absolutely powerful and very clear with great parts he added by heart with great enthusiasm. Mons. Americo Ciani, Canon of the Patriarchal Basilica of St. Peter’s in the Vatican, was presider for the Liturgy of the Eucharist and gave the beautiful homily (translation of the homily by Mr. Raymond Frost below). Mons. Ciani was formerly a judge of the Roman Rota, the highest judicial office of the Church, from the year 2000 to 2009. As a canon, Mons. 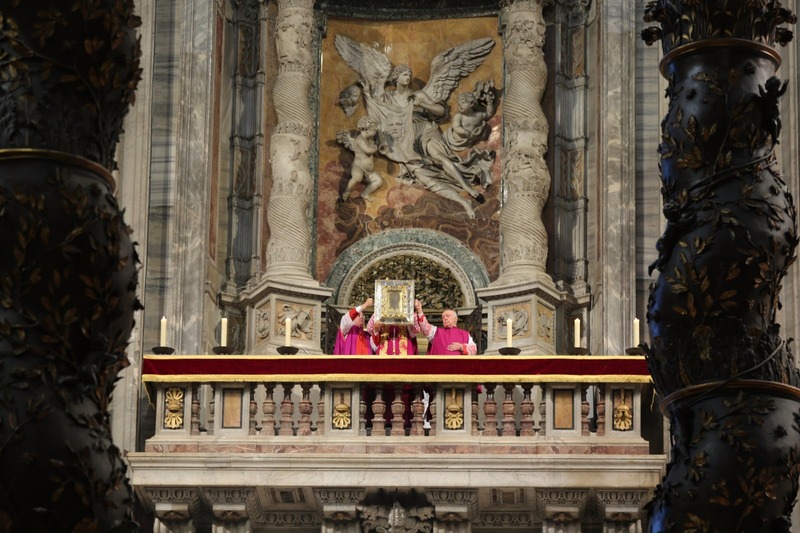 Ciani was also one of the very few persons to have displayed the famous reliquary of Pope Urban the VIII in St. Peter’s Basilica at the balcony over the Veronica altar during Passion Week. We are commemorating that most ancient procession which the great pontiff Innocent III desired in 1208 during which he had carried for the first time the Holy Sudarium of Christ from the Basilica of St. Peter to the Church of Santo Spirito in Sassia. It was a foretaste of the Holy Years, the first of which was decreed by Pope Boniface VIII in 1300. 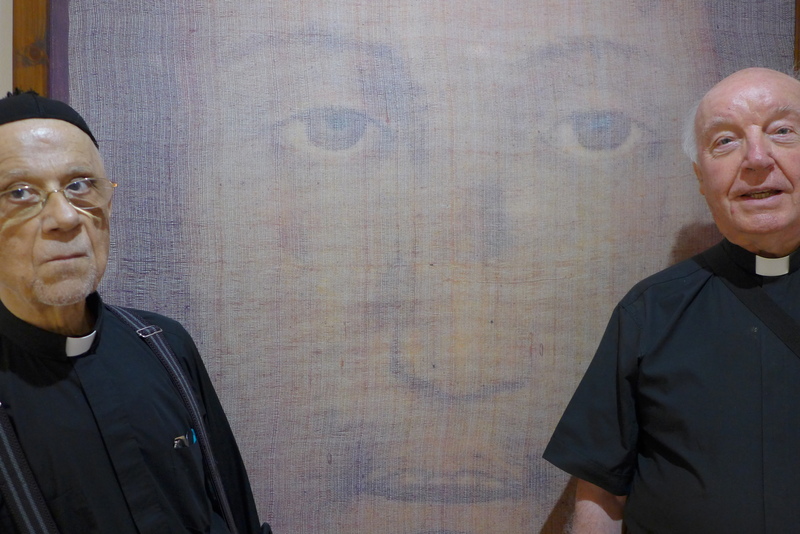 On that memorable occasion the numerous faithful would have been able to contemplate the Holy Face impressed on the mantilla [veil] of Saint Veronica. The Holy Relic, preserved in the patriarchal Basilica of St. Peter in the Vatican, disappeared in 1527 during the Sack of Rome. 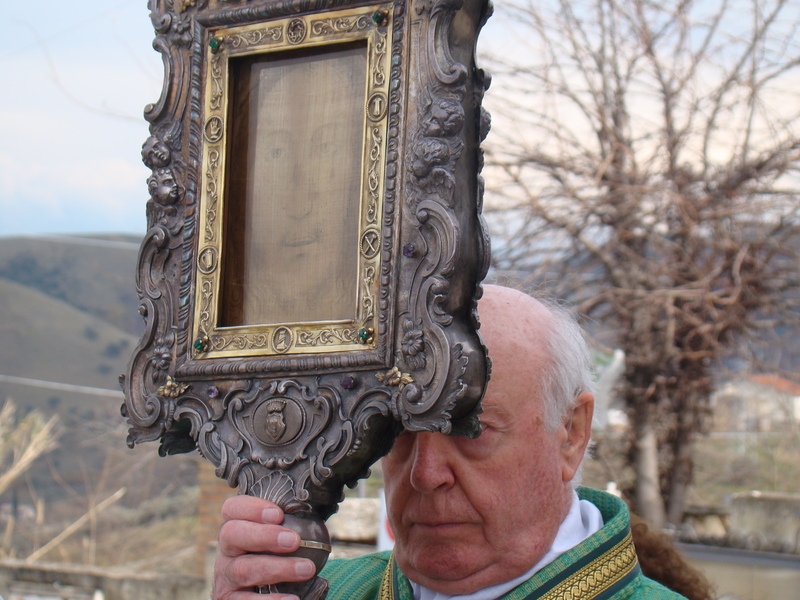 We have repeated the same solemn procession with the Holy Face, preserved here in Manoppello, from the Basilica of St. Peter in the Vatican to the Church of Santo Spirito in Sassia, in January 2016, where we celebrated the Holy Mass, presided by Archbishop Monsignor Georg Gänswein and a second one presided by Archbishop Monsignor Edmund Farhat, who just a few days ago has left us to return to the House of the Father. Here we are gathered to contemplate the Face of God, who became man in His Son Jesus. 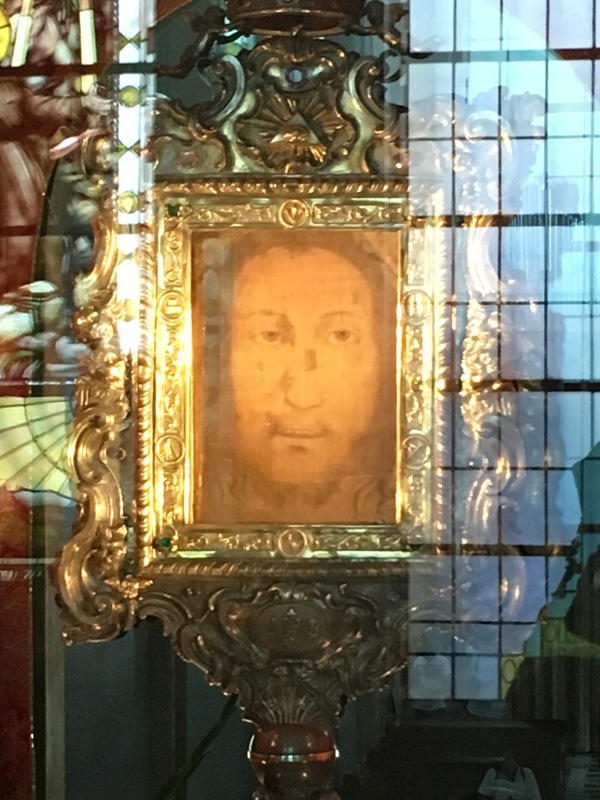 This precious relic is “the human Face of God”, which since 1636 has been jealously cared for here at Manoppello and venerated by Pope Benedict XVI on September 1, 2006, a good 479 years later, when he knelt before that which had been the most precious treasure of the Popes. From the first chapter of the Gospel of St. John, “No one has ever seen God,” the only begotten Son, who is in the bosom of the Father, He has made Him known. On the Face of Christ shines the majesty of God, who in His turn God has shown Himself under the form of a man. 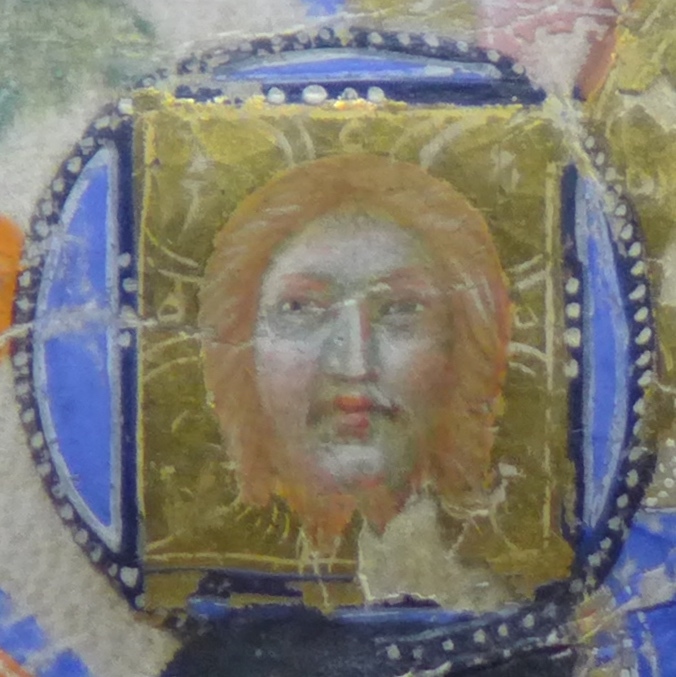 Let us fix then our gaze upon the Face of the Son of God made man. The image belongs to our everyday life. We are immersed in the culture of images, in private and in public. With how much care we display the photos of our loved ones! Go into the rooms of young people, the walls of which are an exposition of images of leaders, from the world of fashion, of sport, of singers, etc. Go silently into cemeteries, how many images to remember loved ones! The list would be too long, and it’s not necessary for us to go on about it. The image speaks louder than the word, in fact the word passes but the image remains. The Church in addition to place, to gesture, to word, to song, has utilized the image, from the beginning she has created a treasury of images to communicate, to evangelize., it is the “Bible of the poor”. The word passes, the image remains and can be admired, contemplated by everyone and in all kinds of circumstances. Word and image speak together in the Church. We are gathered here to contemplate this Image, the Holy Face, which is the Face of God who died and is risen, Jesus Christ, Son of God, He who is Himself God. The Holy Bible, especially in the Psalms, touches on the theme which today is for us so dear: “The Face of God”, the seeking of the Face of God, the desire to see the Face of God, and the invocation to see the Face of God. Psalm 31:16 “Let your face shine on your servant; save me in your steadfast love”. Psalm 119:135 “Make your face shine on your servant, and teach me your statutes”. The problem which today torments us, is precisely fear and terrorism! All of us, whether small or great, need to cast out fear, to cast it far away from us, to succeed in controlling it and in conquering it. The Face of God manifested itself in the Face of His Son Jesus Christ, born of Mary of Nazareth. God made Himself one of us, went about doing good, gave Himself for us and for our sins, and to make us His people. Let our desire to see Jesus be as strong as those pagans who asked the Apostle Philip: “We want to see Jesus” and as Zacchaeus, the publican, who “wanted to see Jesus”, and climbing up a tree, because he was short of stature, precisely so that he could see Jesus. Jesus passed by, looked up and called him by name: “Zacchaeus, come down, today I wish to come to your house”. And from that encounter came the miracle of the conversion of Zacchaeus. Our constant prayer is the commitment: “I want to see your Face”. History is not ensnared in a blind alley, closed off from hope. Our society today is lost, suffers from nightmares, because it has lost “the Face of God”. It does not perceive the ways of God in history. God the Father has sent His Son Jesus among us. He is the youthfulness and the freshness of history. Jesus is the Son of God, of the God that is the joy of our youth. For over 2000 years God has shown His face to the world by the Incarnation of His Son Jesus, from whom beauty and richness has poured out security, above all for those of us who need security: the poor, the oppressed, the “least ones”, because He “ will judge with justice the poor and with equity the oppressed”. So that humanity, turned toward the presence of Christ, will be able to breathe deeply. To judge how things are going, today, one might think that Christ is pretty much just a dream. Christ renews us and make us true. We need purity and to be purified. Jesus has come to accompany us, to put Himself at our disposition. He comes. Jesus in us and we breathe liberty. In Jesus we know where we come from, who we are and where we are going: we who can accompany him, we who have listened to him, we have the power to become sons of God, we are a “new race”, created by God and by Him regenerated in Christ the Lord, Wisdom of the Most High, Word of God, is “the true light which enlightens every man”. He is the Wisdom of God that became love and the love became light. And our struggle continues: It is the mess in which we find ourselves still caught up in (“How long, O Lord? When will you return and finally liberate us?”) Let us repeat with faith “Come Lord, do not delay”. Today we cling to Jesus and tomorrow we run away from Him. We need to enter more vividly into the mystery of Christ. Thus, holiness is possible, even for those who must rise from the depths, because Jesus has come “to do good and to heal all those who are under the power of the devil”. Before, we were under the power of the devil, now no more; the chains on our feet have been broken and we can walk towards the heights. Hope is rekindled in us, “God will return soon and will show his face to the world and shake the foundations with his all-powerful voice”. Just as the Apostle John who entered the Tomb after the Resurrection, “saw and believed”, so it happens for each us today, we see and contemplate the Face of God and we firmly believe. Holy Father, accept with benevolence our prayers and guide us to the seeking of Your Face, which you have revealed in fullness in Jesus, Your Son. O Lord, make Your Face to shine on us so that we might enjoy your goodness in the peace we are protected by your powerful hand, freed from every sin by the strength of your outstretched arm, and saved from those who hate us unjustly.